I wanted to get a mock up together as quickly as possible after waking up and before it faded forever. In that strange way that the subconscious attempts to rationalize and string together seemingly unrelated things according to established patterns, the result was Dungeons & Dragons, but as often happens in dreams, all textual information was completely muddled and oddly transposed. Strangely, everything still made sense, and retained a bizarre familiarity and an intuitive understanding. 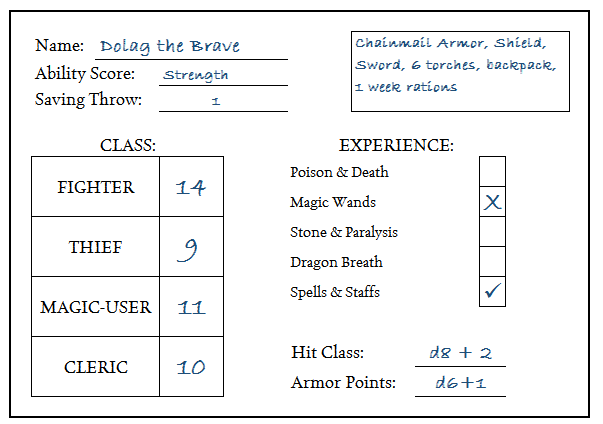 I’ve tried to reproduce a portion of the character sheet above. From what hazy fragments I can recall, the experience of play was still remarkably untouched, but the precise mechanics remain elusive (and sadly no Dreamers Handbook is available to consult). I remember that it was d20 roll under on the Fighter Class Score to attack. Experience was tracked through Saving Throws (attempting them, I do remember that failure and success were notated differently for arcane reasons). No player had chosen the same “Ability Score,” but I distinctly remember the player with Strength remarking that “They were the strongest” and invoking this for assistance with a roll somehow. There were sadly no demi-humans characters. Here’s my attempt. Heavily influenced by recent rereads of WHITEHACK. Class Scores are 3d6 in order (up or down). Or maybe 2d6 + 6 since they are so central to the core mechanisms. Want to Fight? In melee combat, Initiative Counts Up from Lowest Cleric Score to Highest. Roll under your Fighter on a d20, and try to roll high. Above the score is always a miss. The roll is contested with an opposed Fighter roll from whatever you’re fighting. Exactly the Score is a Kung-Fu Number or Critical Hit (no opposed roll?). Highest Roll that's still equal to, or less than Fighter Score wins. Winner rolls Hit Class minus Armor Points for damage. Since you’re fighting, damage comes off the Fighter Class Score. For hard/gritty mode, just roll Armor Points once at the start of combat, and let them get chipped away. Want to sneak around or solve problems with guile and trickery? Same thing, but with Thief, actions are resolved from lowest Magic-User to Highest (if that becomes an issue). Cast or Resist a Spell? Use Magic-User (lowest Fighter first). Turn Undead/Heal someone? Use Cleric (lowest Thief first). If the opposed roll doesn’t involve a direct contest of Class Scores (like Spell casting, or disarming a needle trap), then your target is 10, 3d6, 0r 2d6+6 (whichever works) plus 1 per Dungeon Level, Spell Level, or what-have-you. Failures reduce the Class Score by 1 in addition to any other consequences, if you roll exactly the Score you may add 1 to it, or something really cool happens (or both). You regain 1d6 lost Class Score Points with a good night’s sleep. You choose where the points go. If a Class Score is ever reduced to 0, you can no longer do things associated with that Score. You’re too tired to fight, you sprained an ankle and can’t climb that wall, or all the spells have left your memory. You die if you get hit in combat or when your Fighter is 0 or try to cast a spell with a Magic-User of 0. Your Saving Throw starts at 1. This is how many dice you can re-roll in a given session if you don’t like the results. You can choose to re-roll any die roll (made by you, or someone else) and take the “better” roll. Saving Throw increases in play, by encountering and confronting the dangers listed under Experience. Your GM has the Target Number (3d6 + Dungeon Level, 2d6+6 + Dungeon level, or whatever) and will help you determine which Class Score you will use for the roll. If you succeed, indicate that with a checkmark, future rolls on this category use your best Class Score. If you fail and survive the consequences of failure, mark it with an X. Future attempts on this category use your worst Class Score. If you match your Class Score, put an asterisk in the box. You automatically succeed all future rolls in that category until your Saving Throw increases, and this turns into an automatic checkmark the next time your Saving Throw increases. Given 10 minutes to prepare and plan carefully, you may make a task roll with the Class Score treated as 2 higher. When wearing no armor, reduce damage by 2 points from a single attack. +1d6 Class Score Points with Rest. When all Experience boxes are full, your Saving Throw goes up by one. You can also choose to re-roll the dice for a Class Score (3d6, or 2d6+6, whichever works). Replace one of your Class Scores with this result, even if it’s lower. You may also change Ability Scores at this stage if you desire. Hit Class is determined by Weapon Wielded (here I was lazy and just used standard damage). Armor Points come from the type of Armor worn. Leather is d4, Chain d6, and Plate d8. Add one for shields and one for helmets. 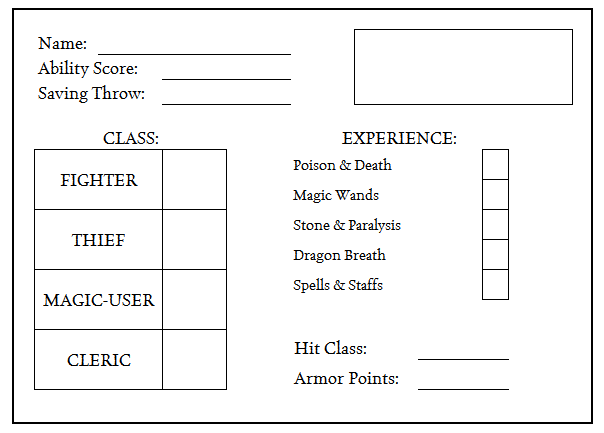 What would you do with a Character Sheet like this?